Paperwhite Therapy – Small Town. Small Times. It’s early January and my paperwhites have just opened. My friend Beth said that I should plant them to bloom after the holidays. I say, she nailed it. Once the tree is down and the twinkle lights are unplugged, winter becomes a daunting test of emotional fitness. But now I have these cheery, little blooms brightening the corners of my rooms. Sure, they might smell a little funky, but so does brie cheese, and who would pass on a warm wedge of that? 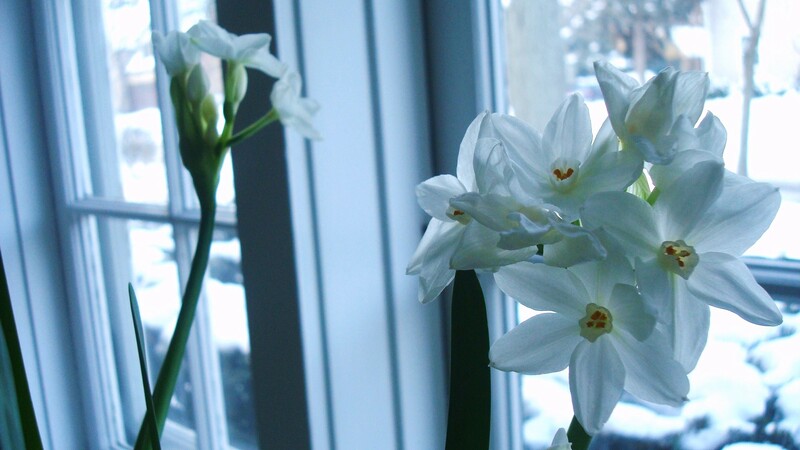 Paperwhites are essential for weathering long winters — as are flannel sheets, pot roasts and votives on the fireplace mantle. Beth gave me some in a white pot with white stones. They looked so artful and clean. I felt like I’d just received a pot of fresh perspective. Another good reason to wait until after the holidays is the bulbs go on sale. Yesterday I saw some selling for 80 cents a bulb. Eighty cents. That is some seriously cheap therapy. With ten bucks, I might actually make it through January. Will you move to my house and be my personal gardener? Not only do I kill every plant I touch, it never even occurs to me what cheering things plants are until I see other people’s houses. I don’t even know what a paperwhite is. Does this mean I have no soul? Okay – ANYone can grow a paperwhite. You just jam the bulbs in some stones and pour in a little water. Keep watering as the water evaporates (once a weekish) and voila – instant cheer. Re: your soul — I think you’re good, but for 80 cents you can know for sure. Yeah….it’s the “keep watering” part that gets me every time. Every plant I’ve had ever had has died a slow, painful death from lack of water. Except the cactus. Okay – point made. Maybe you can find some already potted and just enjoy them while they slowly and inevitably die. Or maybe just buy a bouquet of tulips. Tulips in the winter can have the same theraputic effect – especially orange ones. I know – stones. How ’bout it? Be careful that only the bottom of the bulb touches the water. Have fun.